Belo Horizonte is the capital of the state of Minas Gerais in the southeast of Brazil and is one of the biggest cities in the country, after Sao Paulo and Rio de Janeiro, with about 2.5 million people in the city and well over 5 million in the total metropolitan area. Note that a lot of places including museums, the parque municipal and the Mangueira park are closed on Mondays. Pampulha - This 1940's neighborhood has some of the highlights of Brazil modern architecture, including the São Francisco de Assis Church, designed by the famous architect Oscar Niemeyer (designer of the United Nations building in NYC and also Brasilia, Brazil's capital). The building is not shocking by itself, until you realize it was meant to be a church. Not surprisingly, the Catholic Church refused to consecrate it for more than one decade. Next to the church, there's the Parque Guanabara, an amusement park that is small, but worth visiting. In Pampulha lies the world-famous Iate Tenis Clube, founded along with the Pampulha Architectural Complex designed by Oscar Niemeyer. Invitations to the club can be bought at the place (they are free if you know someone affiliated to the club). 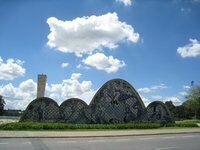 The Pampulha Modern Ensemble is listed as a world heritage site. Mineirão Stadium - One of the largest and newly renovated stadiums in Brazil, where several matches from the FIFA Federation Coup (2013) and FIFA World Cup (2014) were played including the infamous 1-7 semifinal loss in Brazil v Germany. It is located at Pampulha neighborhood. Mangabeiras Park - This is an amazing place for nature lovers, a place where the Cerrado mixes with the Atlantic Forest, this is a great visit for children and family. Museum of Arts and Crafts, ☎ +55 31 3248-8600, e-mail: info@mao.org.br. Praça Rui Barbosa, Centro. . Tue, Thu, Fri noon to 7:00pm. Wed, noon to 9pm. Sat, Sun, 11:00am to 5:00pm. Groups: daily, from 9am-noon. The Museu de Artes e Ofícios is installed in the 19th Century buildings of the former Central Train Station. Its collection shows the richness of Brazilian popular work and professions before the country's industrialization. Admission: R$4. Saturday - free. Alta Vila Tower - Located in the district of Nova Lima, (Belo Horizonte city Metro area), this tower offers a spectacular view of Belo Horizonte and its surrounding mountains. On the main floor is the Hard Rock Cafe - Belo Horizonte. Parque Municipal - An oasis of green right in the centre of downtown. Based on French parks, it has small lagoons where you can rent a boat or feed the ducks. It has the Casa Maluca (Crazy House), the Casa dos Pneus and a small amusement park - three places where children always like to play. Museu de Ciencias Naturais - Take the Metro to the Gameleira station, go NW to the PUC campus, and turn right. Diverse mollusks, whales, and Brazilian forest animals. A new exhibit is under construction. Admission: R$3. Museu Histórico Abílio Barreto, Av Prudente de Morais, 135. Cidade Jardim Neighborhood - (0xx)31 3342-1268 - This museum is dedicated to the history of the city and was created in the only standing farmhouse from the old Curral d'El Rey, farmland replaced by the new planned city. Belo Horizonte's latitude at 19'55" south places it in the tropical zone. Yearly temperatures average between 9 and 35 °C. The Köppen climate classification of the region is tropical savanna climate (Aw) and it borders on a humid subtropical climate (Cwa), (tropical on high altitudes, humid/warm summers and a dry/mild winters). Belo Horizonte is located about 300 kilometres from the sea. Even though inter-seasonal differences are not as pronounced as they are in temperate places, there is a contrast between spring and summer, and between fall and winter. The coldest month is generally July, with a lowest recorded temperature of 2 °C. The hottest month is usually January, with a highest recorded temperature of 37.4 °C. The 852-metre of Belo Horizonte helps a little in cooling the city, suppressing high maximum air temperatures experienced in nearby cities at lower altitudes. Belo Horizonte's climate is mild throughout the year. Temperatures vary between 11 and 31 °C, the average being 22 °C. Winter is dry and mostly sunny, and summer is rainy. Tancredo Neves-Confins International Airport (CNF) is located about 40 kilometres from Belo Horizonte downtown. Azul Linhas Aereas has its second main hub at this airport. Also, Gol Linhas Aéreas Inteligentes and Latam Brasil have regional flights from this airport. American Airlines, Copa Airlines and TAP Portugal have international flights to Miami, Panama City and Lisbon. Belo Horizonte/Pampulha – Carlos Drummond de Andrade Airport (PLU) is located about 8 kilometres from downtown Belo Horizonte. From 2004, the operations of this airport were reduced to small planes with a capacity of max. 50 passengers. Only Passaredo and FlyWays Linhas Aéreas serve the city from Pampulha. Belo Horizonte is one of very few Brazilian cities with a scheduled long-distance train service. A daily train operated by minng giant Vale connects with Vitória, the seaside capital of Espírito Santo state, taking about 12 hours. The central station, 1 Estação Central, is located in the city centre on Av. dos Andradas. You can safely drive to Belo Horizonte from major Brazilian cities, including São Paulo, Rio de Janeiro, Brasilia and Vitoria. You have to pay toll on the roads from Rio de Janeiro and from São Paulo. All major car rental companies can be found in Brazil. You can also drive from/to the historical cities of Minas Gerais, like Ouro Preto, Tiradentes, Diamantina, São João del Rey, Mariana and others. The roads and the city of Belo Horizonte are GPS mapped. Be sure that the GPS contains the latest version of the maps. You can rent cars at the Confins Airport or at Pampulha Airport. All major car rental companies, like Localiza and Hertz have booths at the airports. It is a long drive from Confins airport to downtown Belo Horizonte. Be sure to get a GPS with new maps, since there were some modifications on main avenues for the World Cup. You can also rent a car at other places around the city. BH is well served by buses. The SC buses circulate through the downtown area; others serve outlying neighborhoods. To pay the bus tariff, you can use cash, or the electronic billing card (Cartão BHBUS). For the tourist, its recommended to use cash. As of 2014, you can buy a rechargeable bus card with the onboard agent or the driver for 12R$. You can recharge it on some BRT stations, BHTrans offices or even into some buses. Lemonish-and-gray normal and articulated buses are from the municipal BRT service. Usually, they link some specific stations to some region of the city, and are feed by the yellow or green buses, as well. These buses have air conditioned system, and a little more of comfort. Green buses serve BHBUS bus stations, going from a BHBUS station to downtown and then back or connecting two different BHBUS stations. Grey buses (can be identified by the SE prefix in line number), are the special executive service, and it's a more expensive buses, that circulate through some specific regions. These lines have free Wi-Fi and Air Conditioned system. The Metrô snakes through the city, from Eldorado northeast to Vilarinho, tangential to the north side of downtown. Lagoinha Station is near the rodoviária (bus station), Gameleira Station is near the ExpoMinas Convention Center and Minas Shopping Station is near the Mall of the same name and Ouro Minas Palace Hotel. Unfortunately, unlike subways in developed countries or in São Paulo, the Metrô lines, even though connecting the two biggest cities in the metro area, Belo Horizonte and Contagem, do not cover most of the city and outside the stations can be dangerous (true for São Paulo's). New lines have been planned and when completed will connect downtown to Pampulha and Savassi, the two most visited neighborhoods. The trains are useless for someone traveling. Take a taxi. Taxis inside the safe are generally considered very safe (if a bit expensive). The main taxi companies in Belo Horizonte include Hutaxi, Jo Taxi, Intertaxi, Pitangui and Protaxi. Most cabs in Belo Horizonte are painted white - however, starting from 2012, there are some so-called "special" cabs which are black (and are marked as such). Inside the city, all cabs work with taximeters. However, in case of travelling to the countryside or others states, the fare can be discussed. If you plan to get around the city center on foot, you might want to take a map. Because the city grid is laid out with both ordinal and diagonal streets, it is very easy to take a wrong turn. Also, the land where the city was built has plenty of hills, so one should wear comfortable shoes to go up and down the streets. At night, stay on the main avenues and streets for safety, because it can be dangerous. Minas Gerais is renown for its cuisine across Brazil, and is the origin of many famous foods such as pão de queijo (small baked roll made with cheese and cassava flour) and feijoada (black bean and meat stew). Like elsewhere in Brazil, restaurant food is typically served in some variation of a buffet. People from BH are famous for their love of bars. The central Savassi neighborhood has dozens of bars. Also, at São Lucas neighborhood, on Contorno Avenue, you will find "Sociedad Pub", one of the best Pubs in town (Contorno Av., n.3849). The city is widely known (although without any confirmation) as the city with most bars per capita in the world. Some clubs that charge a cover are overrated and expensive. The outdoor bar scene is the authentic Brazilian experience. Major high-rise hotels are generally on Av. Afonso Pena or at Savassi neighborhood, while mid-range and budget accommodations are clustered around the train station. We have a comprehensive list of accommodation in Belo Horizonte searchable right here on Travellerspoint. You can use our map to quickly compare budget, mid-range or top of the range accommodation in Belo Horizonte and areas nearby. This is version 16. Last edited at 3:39 on Aug 2, 17 by sleepBot. 21 articles link to this page.